Another comeback for an amazing classic. Pac-Man returns in this millennium. But this time, he isn't alone! Bring three friends, for Pac It can be played with four players simultaneously. We predict multiplayer fun of epic proportions. But this isn't the only new feature: dozens of new ideas were integrated into the game. 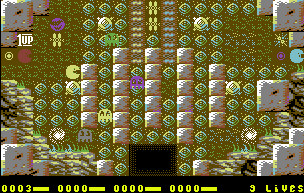 After collecting the necessary upgrades, Pac-man can push bricks out of the way to open up a tunnel; he can sprint away from a ghost; he can jump over some of the obstacles or send the ghosts back in their pen. But beware of the "negative" upgrades floating around: for example one that paints the ghosts black and thus makes them harder to see. Left over lives are split up evenly among all players: every player should give their best or there might be repercussions later... But thanks to the dedicated single player mode, you can practice at home. Some bug fixes and clever ideas are still outstanding, but these are being worked on - slowly but steadily, Pac It is nearing completion. A big thank you to all contributors. A preview is available! Please keep in mind that the preview doesn't reflect the latest development. Spread the preview as much as you can and like. Pac It with ‚Save Game‘ function! Once again we’ve come a bit closer to a release of Pac It. • I shuffled the data around in the memory to optimize loading and now I am absolutely sure it will all fit on two disk sides! 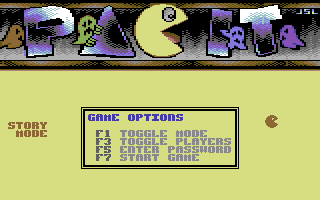 • BUT THE COOLEST UPDATE: Pac It is now able to save the current game state! 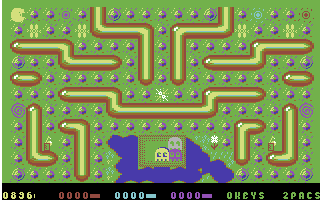 Before each level it is now possible to save the game and continue playing sometime later. 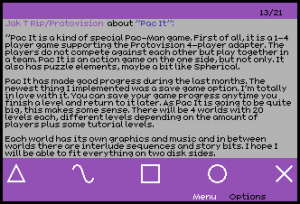 But please beware: the game does not autosave if you run it on an emulator on a smartphone! No, really, it doesn’t. Aaaaalso in the last weeks and months there was good progress around Pac It! * After a rather long odyssee the intro music is finally final! Matching the screen to the intro and vice versa was a hell of a task. Done! * Neat little screens now present not only the passwords but also bits of the story of pac it in between the worlds. The story strikes you as being completely rational and well thought-through. Not strange and odd and all mixed up like you think. No no, not at all. Anyway the interlude sequences are also complete and ready to go! As expected there for dozens of insects that required taming, but now the sequences load and they depack and they run through and have nice musics and what else should you ever want in life? 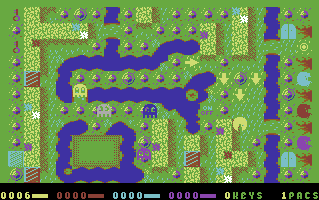 OK. I’m currently working on the core of the game – mainly to get enough disk space out and to optimize loading times, but also to get to terms with all the slime left a little tiny bit undone before. For example I have worked on the score system today and tweaked around with when which player gets what score bonus and when does he receive an extra life for it. Or rather the team, because Pac It is a team game and the players share a common life pool. Ooops, was my last comment really that long ago?! Yesterday I also finalized the screen that presents passwords to the good player (and tells the story a little further). Of course I didn’t want just a simple screen but one where I would include some nice design ideas that would fit to the overall pac it design… at this point I have to thank Wotnau for all his help in bug hunting but also in providing individual routines that have halped me alot (e.g. high score sorting). 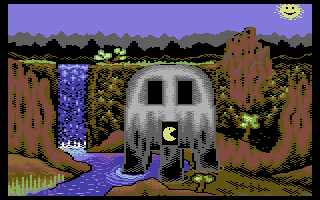 – The Pac It intro music needs an update and I’d love to try to solve a small problem in the PTV intro as well. – Currently, Pac It only knows one of four worlds. The password screens, the sequences that introduce each world and of course the different level files need inclusion. You heard it: it kind of cries for small problems that take weeks to solve. – Did I say level files? 80% of the levels still need to be designed. But I focus on the code for now and make dummy level files. They can be easily replaced later. – Also the sequences between the worlds are not final. Some lack musics, others need to be adjusted a bit so that they fit into the current loading concept. – The end sequence isn’t done yet, music’s also missing. – It could become a challenge to fit the game on two disk sides – but that’s definitely the plan! After all this is done, we still have work to do around the manual, cover and so on… whatever, it rolls on anyway. So stay tuned! Hooray.. JTR worked on Pac It for two entire weeks! It was not easy to spend the time, but it worked out! Finally text appears in the intro. That was more difficult than it sounds, because he writes three lines of text into sprites, while masses of graphics are being scrolled in the background. He had to change some things in order to have enough space for the sprites and the new code. Reassembly of the Game Over screen. Unfortunately, the source code of the Game Over screen had been lost. However, it could be restored with JTR’s own reassembler in surprisingly good quality: Without changing even a bit, the code could be moved and commands included. 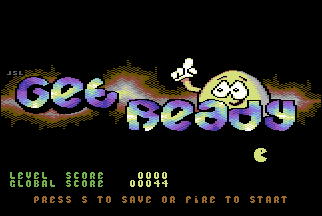 Soon it will be checked here whether there is a high score and acordingly either load the high score screen or titel menu. JTR’s reassembler will also be released „soon“… It also detects hidden code and lo/hi byte of relative addresses…Well… Once again, a great piece of progress for Pac It. Unfortunately, it’s nowhere near completion! But it is no longer about decades but only about years until it comes out… JTR does his best to at least get it out of the fridge! Pac It is alive! 🙂 After looong fruitless attempts it was now possible to put all parts of the Pac It Intro together. There were several space problems… In other words, a small breakthrough in the Pac It project has been achieved, and development finally continues. Click here to open PayPal and donate a sum of your choice to Jakob. 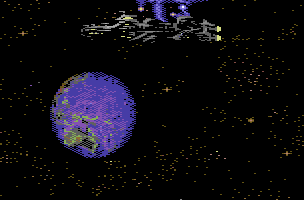 All submissions will directly go to the benefit of C64 game projects!